ECCC Championships – It’s good to be on top! It was a great privilege to finish the road season at our home race near Warwick, MA. The race was an incredible success thanks to Dmitro, James, Dustin and Lucy, our race organizers! We also thank alumni, sponsors, current club and racing members, and members of other teams for lending a hand! Now to the racing! 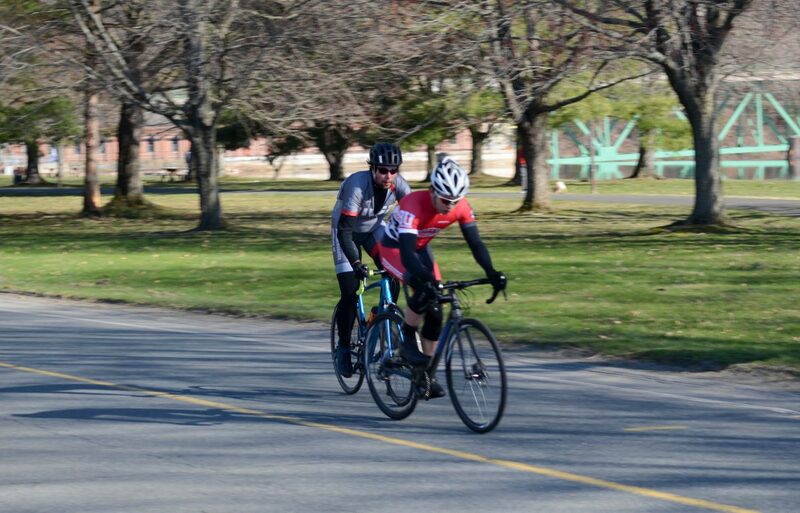 There were some dominant performances across the board, and the MIT men deserve special mention for taking the wins in the B, C, and D road races, as well as the C criterium, for double points! Although several of our women suffered a crash during the TTT that prevented them from racing, Emma held down the fort, taking 3rd in the road race and 2nd in the criterium. 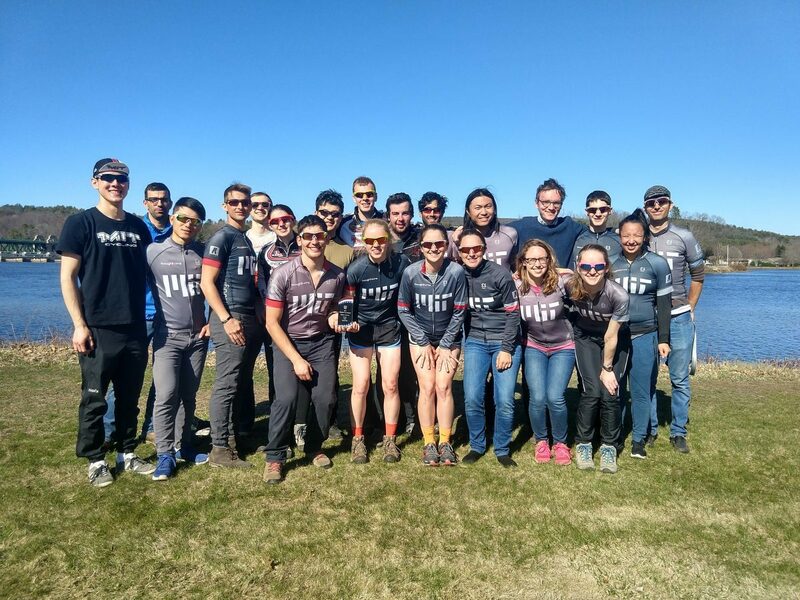 MIT took the ECCC omnium win and was 3rd in points at the ECCC Championship. We are looking forward to sending four women to represent us at Nationals at Grand Junction, CO this year. 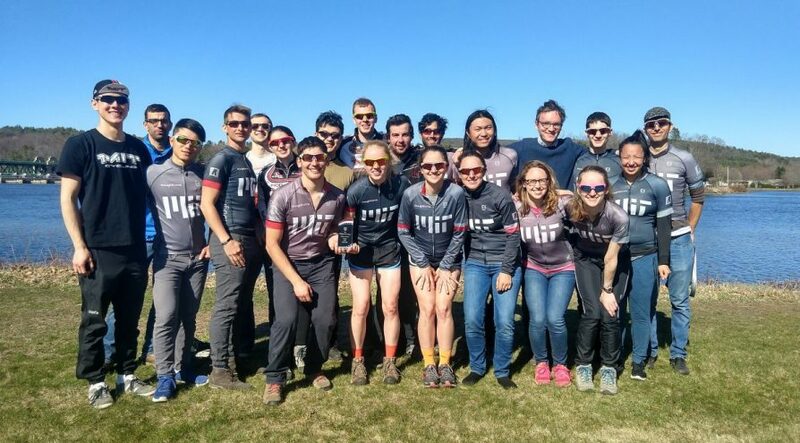 This last weekend was the ECCC Championships, hosted by the one and only MIT team (us!). As opposed to every other weekend of the ECCC season, the weather was perfect – both days featured blue skies, sun, and warm temperatures. On top of that, our coordinators-extraordinaires (the team of Dmitro, James, Dustin, and Lucy) coordinated an incredibly smooth and fun weekend for all of the racers and spectators. One of the really special things was the number of teammates who turned out for this event – both racing and volunteering. I loved both getting to see teammates I hadn’t seen for a while (woo Amanda Chen!) and meet some others for the first time (hi, Andrew Xia!). Saturday late morning and afternoon was the road race – a crazy loop including two challenges climbs (one of them dirt!). Miles Couchman started off the day with a dominant win in the Men’s D field, and Liam Fenlon followed his lead, snagging a win in the Men’s C category as well! The A and B fields raced in the afternoon, and Berk Ozturk was able to complete the trifecta by winning the Men’s B field for the team. Emma Edwards represented the women’s team all by herself, and had a strong second place finish in the women’s A field. That evening, all of the teams met at a local YMCA to share some delicious Italian food and cookies, and celebrate the season and races of the day! Although the venue had been arranged somewhat (very) last minute, it was perfect for the occasion – homey and light-filled (especially appreciated after a long dark winter). All in all, it was really wonderful to come together as a team and as a larger ECCC family to appreciate the adventure that this road season has been. Sunday featured a criterium through downtown Turner Falls, and my day began bright and early with course set-up duty with Quinn and Berk. Despite the massive performances that they had put out the previous day, both of them were cheery and positive as we lugged hay bales around the streets (and then swept up after ourselves!). Although there was still one car left on the course when the races began at 8 AM, everything went smoothly! The course featured a super steep uphill section following by a gentle (but lengthy) downhill ending in a sharp corner – but all of the riders managed it safely throughout the day. The day was capped off by an awards ceremony, in which our team took home the “ECCC Omnium” prize for most points throughout the season (woot!) and a third place award for the ECCC Championships itself. More importantly, the men’s and women’s teams exchanged small but thoughtful (and delicious!) gifts including flowers and cake! All in all, the ECCC Championships was an awesome time to come together as a team, to support our race organizers and to race as hard as we could. I, for one, am already looking forward to next season! After a great performance in the TTT in the morning; Dustin, Quinn and I were ready for the biggest climbs of the season. I was particularly spooked by the dirt climb which was the longest and the steepest on the course. We knew from the beginning that this climb would shatter the field, and it did. Quinn and I managed to make the 8-man lead group as it separated towards the end of the first 16-mile lap, and we had a solid gap by the middle of the second lap. The group was strong, and we managed to stay together for the majority of the second lap. We were busy inflicting pain on each other up the dirt climb for a second time when I decided it was going to be my move. The gradient eased, I got around to the front, and started accelerating. Suddenly, I heard commotion behind me, and realized that at least 5 of the riders were on the ground, including Quinn, and although I was conflicted I decided to commit. A WPI rider was the lone chaser, and he was breathing down my back, with at most 5 seconds of gap at the top of the climb. I decided that I wanted to go solo, and burned a lot of matches to make him lose sight of me. Thankfully this gambit paid off. I settled into a TT pace, hitting the climbs hard, and easing on the flats to try and keep the distance. The best part of the day was having Liam occasionally shout encouragements in his intense gravely voice from the lead car when he would lag back to tell me the gap, which came down to almost 15 seconds at some point! I should have know that Quinn was the unsung hero of the day, because while I was alone TT’ing for the last 20 miles, he was busy staying in the chase pack of 6 riders, demotivating them by telling them that ‘they would never catch me’. The icing on the cake was that he joined me on the podium in 3rd! It was amazing to podium at Easterns, our home race! Averaging 5-6 hours of sleep for a week, no warm-up to speak of, and a fueling plan that consisted of some coffee and half a muffin hastily eaten on the drive down is not the most ideal crit prep – yet there I was, lined up and 30 seconds from the gun (whistle). Since it was our home race MIT riders got a call up. We had a whopping 6 riders in the field and basically took up the entire front row. At this point Miles leaned over and asked what my plan was for the race. Oh yeah, a race plan, I should probably have one of those. I hadn’t really thought about this at all, and went to my standard answer “rubber side down, and surviving, that’s all I’m shooting for”. Secretly I was thinking that I’d be lucky if it I managed to not get pulled, I was hoping that Miles would get into an early break (he’s been killing it this season), that way I could sit in the pack, hang on for dear life, and claim that I had done “hard work” blocking for him. The whistle blew, and we were off. I’ve been racing a lot of CX this year and it has bled into my road riding, so I took off from the line, about 5 seconds in I looked back and saw that my fellow CX rider Tobi and I had maybe 15 meters on the rest of the field. I turned to him and said “wanna go for it” and boy did he! While I drifted back to the pack he shot forward and was off, he stayed away, alone and in the wind for 18 mins while Miles and I stayed near the front of the pack, blocking where we could, and shutting down attacks. During this time Tobi also managed to pick up both primes, winning the quart of maple flavored yogurt donated by our friends at Sidehill Farms. With 8 laps left the pack eventually decided to organize and proceeded to catch Tobi. As we came around and saw 7 to go the pack caught Tobi, and we were all together again. As soon as Tobi was swallowed up by the group I attacked. I was away, I was alone, and I was flying – after one lap I had built a sizable gap — adrenaline is one hell of a drug. The issue is, I was running on adrenaline and nothing else. I came around the finish line, this time seeing 5 to go on the board, and entirely unsustainable numbers on my Garmin, and was mentally broken – I couldn’t keep up this pace, I had tried the solo break game early this season only to get caught meters from the line, this was it, I was done. Somewhere during this crisis of confidence I realized I had a rider on my wheel, a racer from BU had bridged up to me. With someone to work with my despair was, if not eliminate, at least mitigated. I worked with the BU rider and over the next few laps we managed to grow the gap on the pack even more. As we came onto the finishing straight in the final lap I was positioned perfectly, glued to the BU riders wheel and ready to launch my sprint. When we hit the 200 m to go mark my mind screamed “SPRINT”, unfortunately every single muscle in my legs scream “NO” just as loudly, and consequently I could only manage the most halfhearted of sprints – finishing a few bike lengths behind the BU rider. Still I was thrilled, I had managed to podium my own race. The rest of the day went great, and everything ran smoothly from a promoting standpoint (primarily due to the awesome planning done by Dustin and the great work of James).